I’ve posted a new version of my Survivor audio book. This time around narrated by my friend Andrew Frueh. A very talented guy who has worked on projects ranging from games, animation, and even robotics. Take a look at some of his work over at http://www.andrewfrueh.com/. I think you’ll find this new version has much better audio quality thanks to the equipment Andrew had available, and his performance really brings the characters to life. A team of asteroid miners stumble upon a strange material buried deep within the rock. This amazing find could make them all rich, or prove to be their undoing. I recently finished editing an audio book version of my first short story, “Survivor”. Narrated by my friend Carlos Vaca Mora, it’s a science fiction, horror story with an action packed conclusion. The Summary: Jake Salnen awoke to find himself trapped under a pile of debris. He managed to free himself only to to discover the remote surveying compound where he worked had been attacked, and all his fellow personnel are now missing. Injured and alone, Jake searches the abandoned camp for answers, but may be unprepared for what he’ll find. Hope you’ll give it a listen, and be to follow me over on SoundCloud for future podcasted stories. Katherine Vestan is trying to relax after a stressful day at work, but her difficulties are just beginning when an explosion rocks the city. Was it an accident or a terrorist attack? It’s the least of Katherine’s worries as she realizes her six year old son has snuck off in the chaos. Desperate to find her missing child, Katherine investigates the rundown warehouse across the street, which may not be as abandoned as it looks. I recently decided to remove some of my earlier shorts, “The Tombs” and “Over a Meal” from the stories page. They are older entries that don’t reflect my current writing style, and proceed some of my newer ideas like NC chips and OnBoard assistants. More importantly, the titular Reptilia Droc do not appear in either story. Instead the threat is a hint towards a different opponent. The creatures referenced originally appeared right away in the series, but will instead appear as a future threat. I may rework theses entries down the line, but for now, I want the stories page to remain focused on the Droc who are still mysterious themselves. 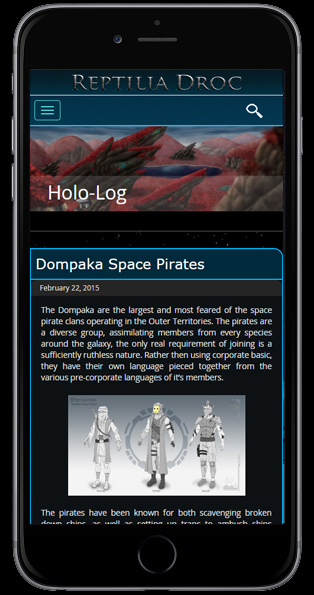 But for those who want more adventures set in the Droc universe, the stories are available below. 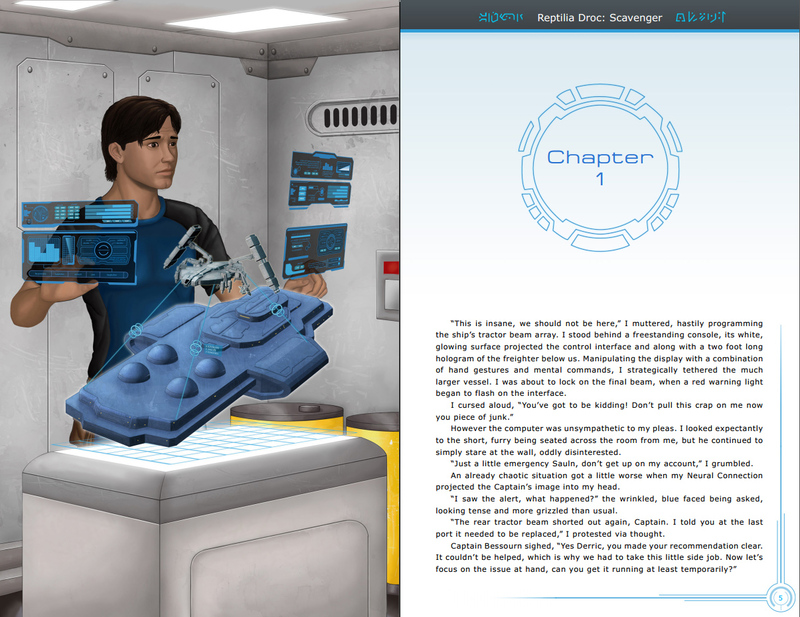 Engineer, Alec Phirth, requested a transferred to a star-ship in hopes of finding adventure. However, his enthusiasm quickly disappears when Alec is assigned a solitary position among the ship’s dark and aging maintenance level. The situation worsens when he begins to suspect there’s something else stalking the silent halls. In deep space, three crew-members narrowly escape the destruction of their ship by a powerful, unknown force. But over a meal, they discover that they aren’t out of danger yet. Wealthy, corporate director, Masso Dubar, enjoys hunting exotic animals. For his latest trophy, Dubar has traveled to a distant planet called, Amothwa, with his sites on an endanger predator. Dubar has every advantage on his side, from an experienced guide, to advanced probes and weapons, but regardless, he may find himself to be the Hunted. I recently completed work on a new short story called “Survivor”. Jake Salnen awoke to find himself trapped under a pile of debris. He managed to free himself only to to discover the remote surveying compound where he worked had been attacked, and all his fellow personnel are now missing. Injured and alone, Jake searches the abandoned camp for answers, but may be unprepared for what he’ll find. The Reptilia Droc series is set in a far flung future, of an unfamiliar region of space, rife with alien species, cultures, and technology. 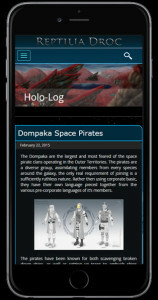 To this end, the Blog section serves as an online encyclopedia for the Droc universe, with entries on all of the relevant characters, locations, technology, and factions featured in my various stories. Articles can then be sorted by subject using tags and categories to quickly track down related content. Tags can be found at the bottom of each post, the sidebar menu, and the Tags page. Also use the magnifying glass icon at the top right of the page to search for specific characters or terms from the stories. In this section Chris will track the status of his projects, announce new short stories which have been posted, and works in progress. As well as up coming conventions and events he will be attending to promote his work and meet with fans. The Reptilia Droc series combines Chris’ love of reptiles and science fiction. In that spirit, this section of his blog is dedicated to sharing stories from around the web, involving reptiles in science fiction, real-life reptiles and dinosaurs, and conventions or exhibits he’s attended. See the stories page page for a list of all projects underdevelopment and completed. The first chapter of the novel is available to read as a PDF. There are also several short stories available to read in their entirety. Read the stories here on the site, or download the PDF’s for the Droc themed page skin. Comments are currently turned off on the site, so that moderating spammers won’t take away from working on the next story. However, Chris would still like to hear from you. Questions, feedback, and comments on the stories and artwork are welcomed and encouraging. So be sure to stop by and write on the Droc Facebook page, or contact me directly. Welcome to the new reptilia-droc.twd. Re-designed to show more illustrations through new, large banners, and to be more phone and tablet friendly, so you can keep up with the Droc on the Go. The illustrated preview of Scavenger: Chapter 1 is available to Download, click here. Take a look and let me know what you think here or on the Facebook page.